I just got a email from the Dodgers highlighting their newest promotion. Starting this coming homestand, fans will have the opportunity to sit in “Mannywood,” an area named to honor left fielder Manny Ramirez. Field Level seats, fair of the foul pole in left field, will be sold in pairs with exclusive Mannywood T-Shirts for $99. Ramirez wears Number 99. The seats, the closest to the Dodgers left fielder, are in sections 51 and 53. Fans can order online at dodgers.com/mannywood. 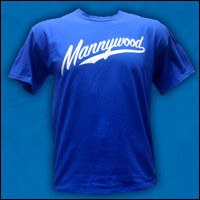 The limited edition Mannywood T-shirts are only available through the promotion. On May 5, in celebration of Cinco de Mayo, a limited edition “Yo estuve en Mannywood” (“I was in Mannywood”) T-shirt will be given to fans who purchase tickets in Mannywood. The funniest thing is all the guys gawking behind the fence. And of course, this pic makes me think about that book Chamberlain wrote. I wonder if these 2 ladies made the cut. 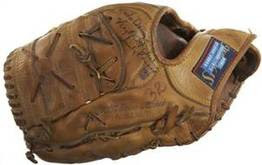 How would you like to have a actual game worn glove from Sandy Koufax. Well, this past weekend a real glove with excellent provenance sold at Heritage Auctions on Saturday. It sold for $107,550.00 (including a 19.5% Buyer's Premium). Wow. Based on that there is no doubt this is the real thing. With the new season in full swing I figured it was time to unearth a segment I started last year, but stopped. I bring to you the "Card of the Week." Now, for this first installment of the 2009 season I am highlighting a Dodger, but don't expect me to only favor the Blue Crew. In fact, I'm gonna try to mix it up a bit. Now, this is one of my all-time favorite oddball cards. Below is Roger McDowell's 1993 Upper Deck card #250. In it, he proudly displays his Lasorda University t-shirt.